I’ll never know all of the things God has done for me. I’ll never know all of the ways he has protected me and guided me. I try to stay aware of his movements but the cacophony of the world around me so easily drowns God out. Looking back on their last forty years, the Israelites could see how faithful God had been. Forty years and their clothes didn’t wear out? 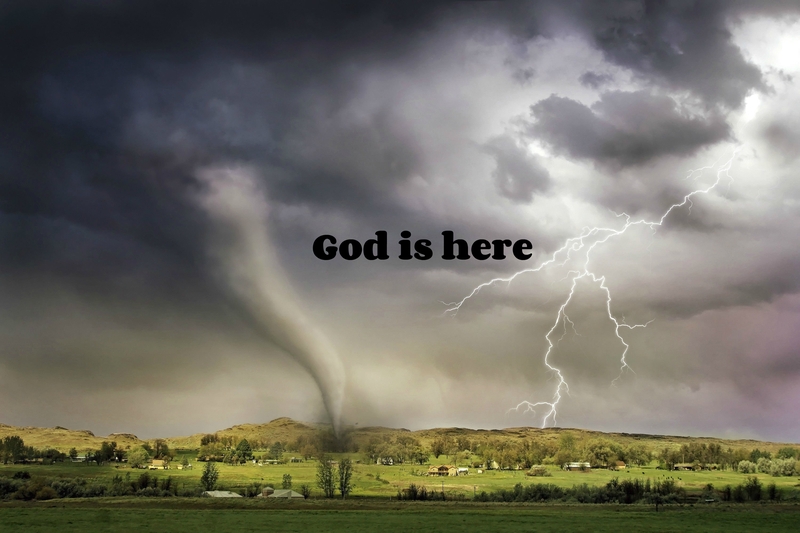 What an obvious act of God – and very practical. As they continued to move across the desert, replacing clothes would have been difficult. So God took care of their clothes as well as their feet. A massive crowd of people walked through the dry, hot desert for 40 years and didn’t have problems with their feet? Only God could do that. As I read this, I am comforted to know that God is taking care of issues like this in my life as well. Every once in while, God gives me a glimpse of a potential problem that he has taken care of in my life and it reminds me of how much more he blesses me and watches over me each day. When I look back, the distractions of today drop away and I can clearly see God’s faithfulness in my life from before I was born. I can come up with a very long list of little problems and huge issues that God has handled – caring for me and loving me through it all. When times are tough, what I genuinely believe about God comes to the surface. In the center of the struggle, my actions show my real feelings about God. When I’m in the center of the storm, do I turn to him? As my world spins and swirls, do I look to him for direction? 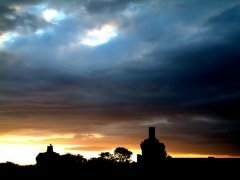 And – the big question – when its dark and discouraging, do I trust him? Do I trust him when my heart is shattering into a million pieces? Do I trust him when all of my future plans have just been blown apart? Do I trust him when my life becomes sad and painful? These are the situations where my true feelings about God are revealed. The good news is that these are the same situations where the strength and power and grace and love of my Father God is also best revealed. He’s always there – right in the middle of all the questions and problems and frustrations. “I am Yahweh – the Lord.” God said these words to Moses thousands of years ago when Moses was faced with the extremely challenging task of leading the Israelites out of Egypt. ‘God Almighty’ is my God. He has revealed himself in new and beautiful ways in the middle of the tragedy I have been going through these last 2 1/2 years since my son was killed. God has been faithful through the storm of grief and emptiness. 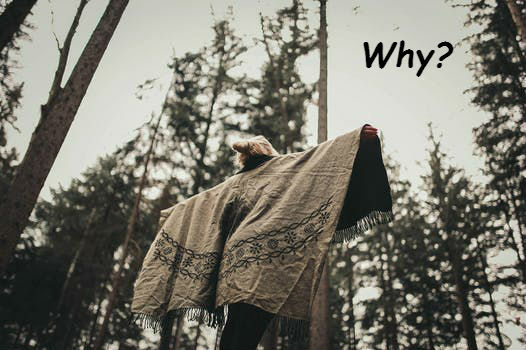 We often ask these questions when trials and tough issues come our way. I have learned to watch for God moving in my life as I’m persevering through trials. 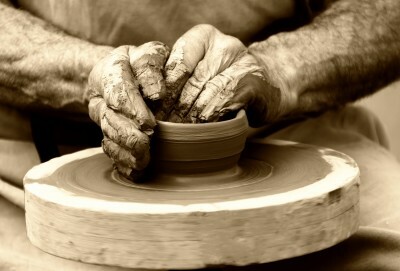 Where is he re-molding me? What thoughts is he renewing in my mind through this suffering? What is he washing out of my life through all of these tears? I know he is building my faith as I persevere because it’s never more obvious to me how much I need him than when I’m going through a painful experience. And I have watched him strengthen my character as I persevere. He reveals areas of weakness in my thinking and replaces them with his truth. He tests my convictions and transforms me as I ask for wisdom in my trials. Through all of this, he gives me hope. I can see him working. My trust in God grows as I watch him bring light out of the dark sufferings in my life. He has a purpose. He has a plan as he draws me closer to him. As I count on him, God covers the pain with his grace and love – every day. Thank you for answering my question, Abba Father. I have been told that the definition of mediocre is inconsistency. I agree – a lack of consistency will get you mediocre results every time. If I had to use one work to describe the Israelites after they were freed from Egypt, I would use inconsistent. We read in Exodus the dramatic account of God dividing the Red Sea to let the Israelites go through on dry land – a wall of water on their right and a wall of water on their left. Wow! Then God drowns the Egyptian army right in front of their eyes. That’s exactly what should have happened to the Israelites! But it didn’t. They actually trusted God and Moses for just a very short time before they started grumbling. Right after their song of praise to God, we read they are complaining that they were going to die out in the desert. Inconsistent. “I believe” one day. “Oh, maybe I don’t” the next. Is our faith like that? One day we’re trusting God with everything and the next we’re grumbling and doubting? This really challenges me because I don’t want to have an inconsistent, mediocre faith. I don’t want to have the same ‘on again, off again’ response to God that the Israelites had. That kind of faith will not stand strong through the trials that keep coming my way. A mediocre faith will sink under the waves of frustration, anger, sadness and pain that wash over me as I try to deal with all the ‘stuff’ life throws at me. A mediocre faith just won’t cut it for me. So consistency is one of my goals. I have found that this helps – when I feel doubts and questions starting to surface, I remind myself of the many ways God has blessed me in the past. I remember all of the promises he has kept and all of the mercy he has shown me through the years. 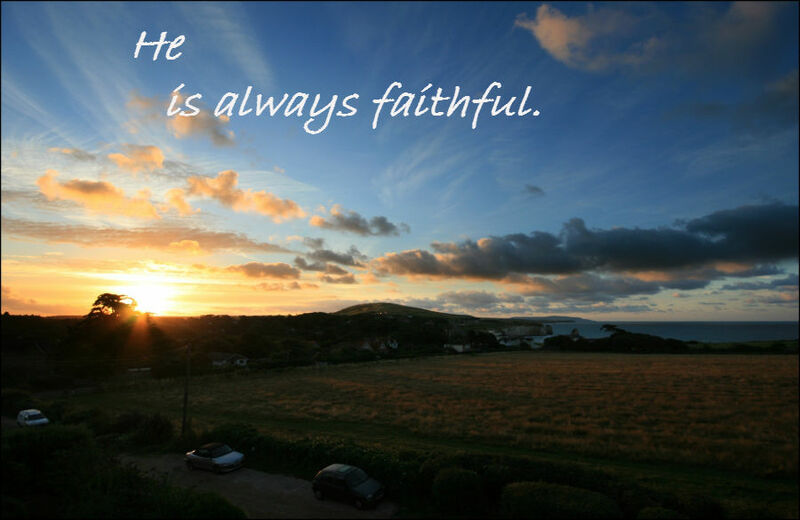 Remembering his faithfulness to me helps me continue to be faithful back to him. 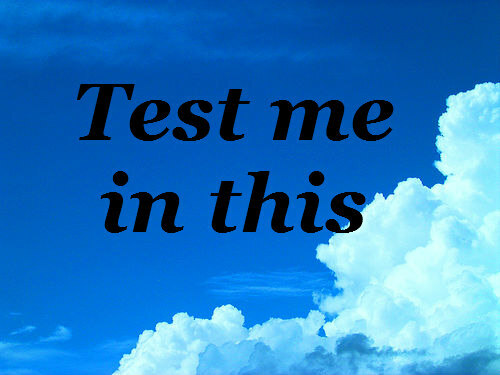 “Test me in this.” God says to us in Malachi 3. It’s the only place in the Bible where God challenges us to test him. He wants us to check him out. Because we will find that he is faithful. The real question is – who is God of my life? If possessions are my god, I will not have enough money to tithe. If ‘stuff’ is too important to me, I will never have enough money to tithe. But- if the One True God is the God of my life, I will have enough. I will have more than enough. Just ask anyone who has put God in the center of their finances and has made a habit of giving a tithe back to God from their first and their best. They can tell you story after story about God’s faithfulness in return for their faithfulness. Checks come in the mail from places where we weren’t expecting any checks. Do you want to see strange ‘rebates’ and ‘overpayments’ coming to you in the mail? Become faithful with your tithing and you’ll start seeing them. Repairs on our houses or cars that should have been very expensive suddenly cost two digits. Don’t ask me how. God just makes it happen. Other generous people who are following God’s leading will give us cars and money and possessions just when we need them. When we are faithful in giving to him, God opens the floodgates. And many of the blessings he gives us are things that no amount of money can buy – like peace and joy and purpose. If you haven’t tried it, go ahead! Test God! Thank you for your many blessings, Abba Father. or the chaos in our world. Because God is always loving and caring for us. One of my special joys in reading through the Bible every year is when we read words that were used in the old famous hymns. I was raised in a musical, conservative Christian home so these hymns bring back precious memories. 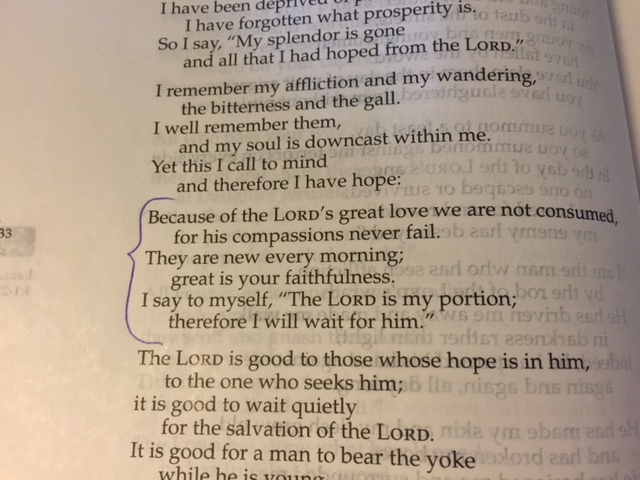 We read in Lamentations 3 that God promises to be faithful to us. And, as the sun rises each morning, I am reminded of his promises. His compassions never fail – we receive more grace and love every morning. He is never late ( even though it can sometimes appear that way to us). Whenever doubts about God enter my mind, all I have to do is look back. And I see God’s faithfulness to me day after day, year after year. Even when I wandered, God never left me. He never stopped loving me and caring for me. Just like he cares for me today. And I know I can count on him to love me and care for me all of the rest of the days I walk on this earth…and on into heaven. Great is your faithfulness, oh God, my Father! 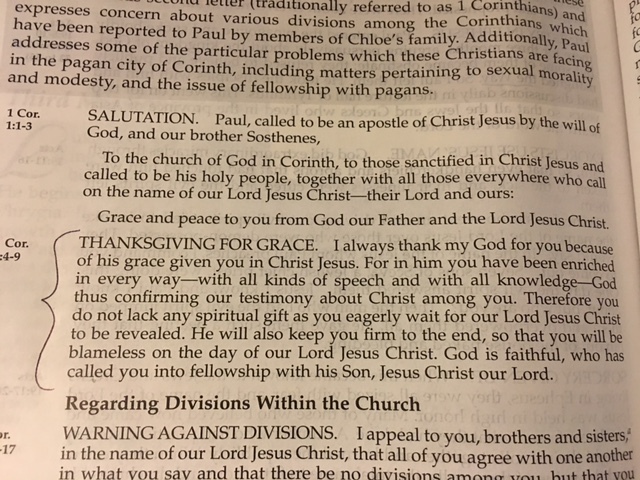 Thank you, Father, for the truth you have given us through Paul’s first letter to the Corinthians. We are grateful for your son, Christ Jesus, who brought your grace into this world for each one of us when we believe. We ask that you enrich our words and inhabit our thoughts with your wisdom. Confirm your truth in our lives every day, dear Father. We are grateful for the gift of your spirit living within us as we eagerly wait for Jesus’ return. Please keep us firmly rooted in you, dear Father – all the way to the end of our purpose here on earth. Thank you for your faithfulness to us, dear God. Thank you for the personal relationship we have with you. We are tugged in a hundred different directions. Our ‘to do’ lists go on and on and on. They keep getting longer, not shorter. Sometimes it feels like we’re literally being torn apart by it all………. 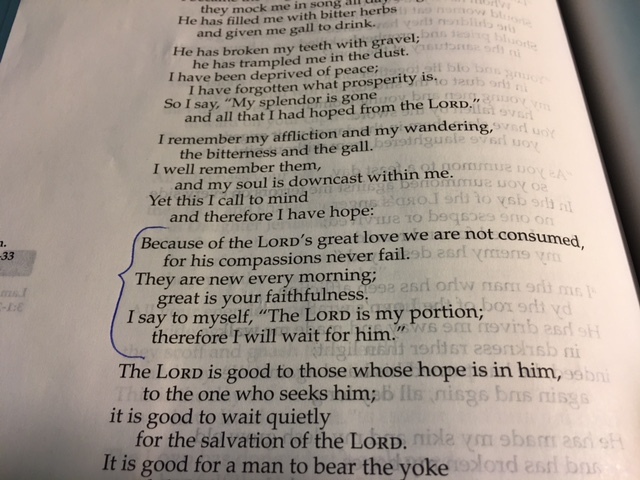 but because of the Lord’s great love for us, we are not consumed. Feel the peace of our Father God seeping into your soul…. God knows everything about us. And he cares about each detail. We are reminded of his promises of renewal and forgiveness and joy each morning as the sun rises on his command. Great is your faithfulness, Abba Father. I will wait for you. I will watch for your direction. I will listen and obey. There are so many thoughts and feelings fighting within me, dear God. There are problems and situations rising up all around me! I find myself often thinking that you aren’t in control of this. That you aren’t going to work this one out for my good. 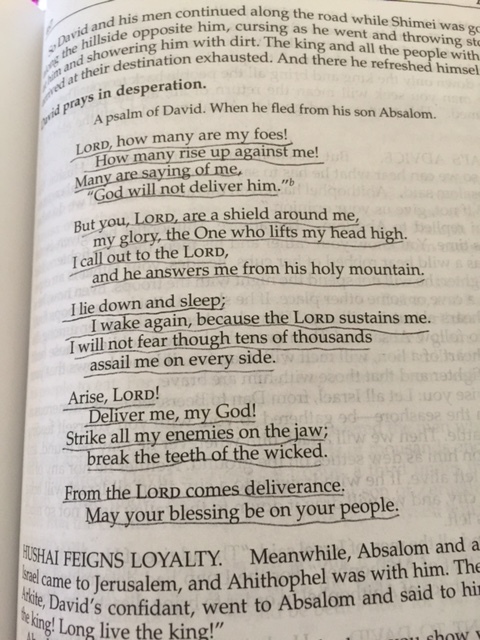 But I know, dear Lord, that you protect me. I know that your power within me can lift my head up high so I can see you. So I can focus on you. When I call out to you, you always answer. I can sleep at night because you are with me. I have no fear because I know that you love me and give me strength. Deliver me from all the things that distract my attention away from you. As a wave of other people’s voices washes over me, dear God, help me to hear only yours. I know you will deliver me, God. You have proved your faithfulness to me. May your blessing be on us, your people.